Check the sidebar for more information on this challenge! I am trying to stay one day ahead of the challenge. That way, if I experience a bad flare one day and cannot nail paint, I don’t fall hideously behind like last year! It’s the worst feeling in the world to miss a couple of prompts and not be able to catch up. You know what I can’t find very easily anymore? Skratch Art pages! They were my favorite crafts and so easy to find in the kid’s aisle at the drugstore. Now everything has gotten all fancy-shmancy and I can’t find these simple pleasures. I may not be able to play with the real thing but I can certainly re-create it on my nails! I L-O-V-E how this came out! 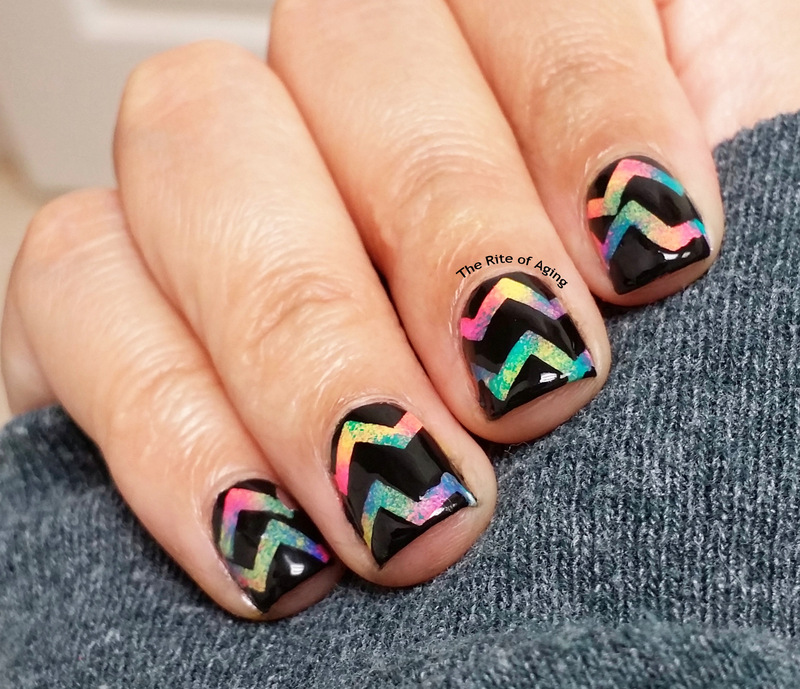 Neons are my faves…and while I may not be the biggest fan of chevrons, these KBShimmer decals are easy and work well with this design. Oh, nope…very similar colors though!